Maisie Williams attends the "Game of Thrones" Season 8 screening at the Waterfront Hall on April 12, 2019 in Belfast, Northern Ireland. 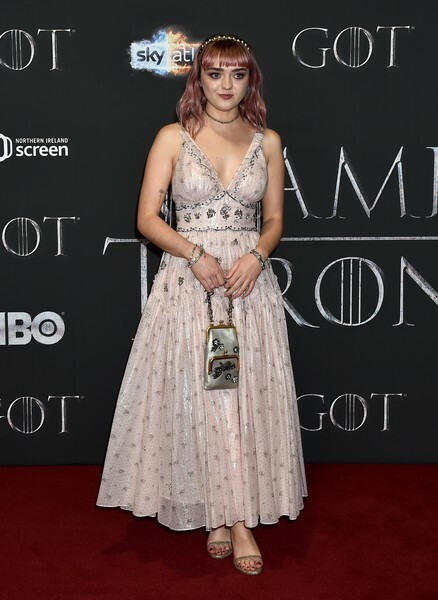 Maisie Williams looked perfectly sweet in a beaded blush gown by Coach at the 'Games of Thrones' season 8 screening in Belfast. Maisie Williams paired her lovely dress with gold evening sandals. Maisie Williams polished off her ensemble with an embroidered satin purse, also by Coach.